Myott’s popular decorative wares of the 1920’s,1930’s and 1940’s can sit beside some of the best Clarice Cliff and justifiably hold its head up high. 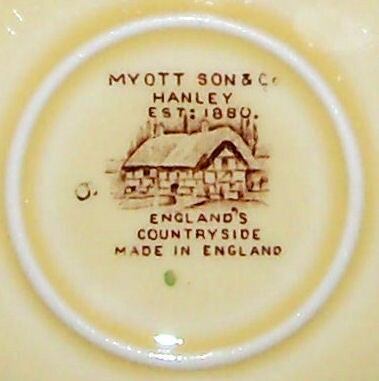 With an autumnal palette (hues popularised by the Art Deco movement of the 1920’s and 1930s) and bold slabs of applied collour and naïve, almost careless washes, Myott pieces are highly distinctive and unique in Twentieth Century ceramics. Once you have seen a few pieces of hand-painted Myott you will become accustomed to spotting the distinctive style of other Myott pieces with ease.